"This all sounds great, but our pipeline is full right now. Let's revisit this next quarter." "Another project came up so we had to put this aside for now." "We had a couple of people move onto other projects for the next few weeks so we have to put things on hold." "It's just not a priority for us right now." We have all heard an excuse or two from a client as to why the project they have previously committed to is losing traction or have stalled completely. As more and more of these deferred projects pile up, the entire organization starts feeling the strain and frustration. Sales is frustrated because they keep getting asked why a client they closed months ago isn't producing revenue. Operations and infrastructure are frustrated because the resources they have planned to support these clients are now sitting idle. Everyone seems to pinpoint the bottleneck to the services organization, but at the end of the day, a project can only go as fast as the client allows. We as trusted advisors can try to objection handle our clients' excuses. However, the best-laid project plans and ironclad contractual deadlines are sometimes not enough to push a client into action. Why is that? The client doesn't believe what we are doing is relevant to their business. The client has no other option - Clients care if there is no looking back from the decision they have made, and irreparable harm will befall the organization if we don't follow through. The learning management systems (LMS) company I worked with at the beginning of my career, D2L, found themselves in this enviable position constantly: A school board or university has discontinued their previous LMS and a new one must be online before the next school year begins. There's no looking back: either we do a good job and get everything up and running or no one is doing any learning come September. Client has FOMO (Fear of Missing Out) - Clients care if they are in a highly contested market and their competitor has something they don't. Imagine your client is only one of a handful of major consumer goods retailers in the area, and suddenly one has a brand new technology that allows for their products to look animated on their website. Suddenly, your client calls to suggest that they have that feature developed and deployed immediately to maintain some semblence of parity. The above two scenarios are mostly out of our realm of control. Our clients make business decisions that are in their best interests, not ours. At the same time, we have no say over what their competitors decide to do (unless they are our clients too... but that's an article for another time). So if our clients don't fall into either of those scenarios, what can we do to get traction? We can align our projects to their business roadmap so our projects stay relevant. Business roadmaps are generally proprietary. To share it means our clients fully trust our promise to be confidential and discrete. Business roadmaps provide a glimpse into our client's growth strategy (or lack thereof). To share it means our clients depend on us to help them reach their objectives. Business roadmaps detail how our clients intend to execute on their strategy. To share it means they want us to work in lockstep with their plans. The last point is critical. Understanding our clients' business plans allows us to gain insight into their anticipated pains, and we can then devise our solutions to help them solve those pains. Our solutions become an integral part of our clients' strategic and tactical plans, and by doing so we create relevancy and healthy dependency that keeps project momentum forward. We end up proposing and executing on projects that "move the needle" for our clients, rather than just randomly implementing a bunch of solutions that they don't need. It's also critical that the entire organization, especially sales and business development, understand the importance of relevancy. 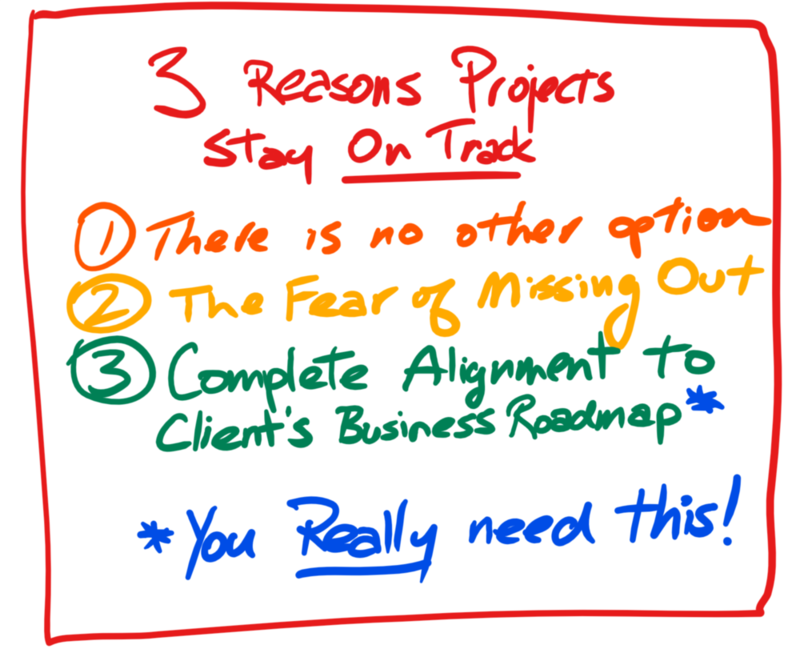 Projects that are not relevant to a client's business roadmap will most likely stall, no matter the flash and glitz of the sales presentation. Ensuring that the whole team is bought-in on the idea of aligning solutions to a client's business roadmap and anticipatory pains will yield projects with quality and on-time executions. The next time you review your organization's services pipeline, ask yourself: Are what we are doing relevant to our clients? If you can't answer that question with a definitive YES, then it's time to take a pause and gain some trust by making a case to really understand your clients' business roadmaps.